If you turn on the radio, chances are that you will hear the familiar sound of Taylor Swift’s “Shake It Off.” The staff members who are part of the high schools’ Compass Committee, however, are trying to get new lyrics stuck in their students’ heads: shake it down. This semester, the WBHS Compass Committee is working hard to reform its program so both students and teachers are more involved. The committee is specifically focusing its efforts on improving its compass points, which students are supposed to receive for going above and beyond classroom behavior expectations. The committee especially hopes to increase student interest in the compass points by increasing the value and frequency of the points. Clark would also like to add that the goals of the committee reach beyond just distributing the compass points. 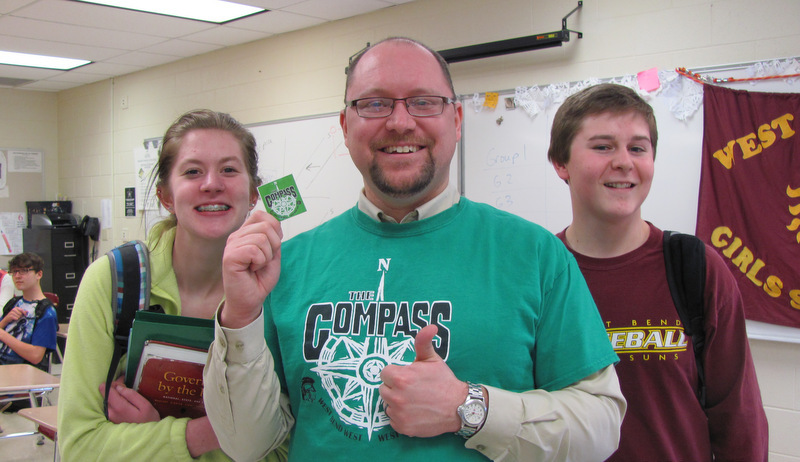 “Our ultimate goal is to not have kids forget about the Compass,” he said. Clark is particularly excited about the “shakedown” that happened earlier this year. During the “shakedown,” students were asked to count up the Compass points that they have received so far. The class with the highest number of points per student received a prize. “If we do this right, we all benefit,” said Clark. The committee has come a long way from its humble beginnings. Last year, the Compass Committee was experiencing some internal problems, which prevented it from reaching its full potential. According to Kim Barrett, an East English teacher who currently serves on the committee, the program was rather unorganized. “We had two leaders who did a good job, but the subcommittees as a whole lacked organization and structure” Barrett said. She is, however, very optimistic for the future of the organization. The future of the Compass Committee is very bright indeed. Matt Hoffmann, a social studies teacher at East and teacher coordinator for the committee, is proud to say that the program is not going away. “We want it to be in the back of your mind when you walk around,” said Hoffmann, when speaking about the Compass program. “We’ve given out some awards and big prizes, like a year-long pass to the YMCA, that no one has heard about this year,” Hoffmann said. His other goal for the committee is to increase the value of the compass points. “We’re trying to do a lot of things, like make the compass points be meaningful, like worth something at the school store,” Hoffmann said. No matter what changes have or will be done to the program, the program is certain to remain true to its goals of emphasizing good student behavior.